The item Embrace the chaos : how India taught me to stop overthinking and start living, Bob Miglani, (electronic resource) represents a specific, individual, material embodiment of a distinct intellectual or artistic creation found in Austin Public Library. Like many of us, Bob Miglani felt overwhelmed and anxious. He worried constantly about his job, his finances, and his family. It was a chance invitation to India, the land of his birth, that finally freed him. 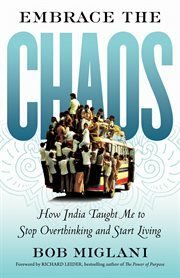 India, Miglani writes, is "the capital of chaos": over a billion people living on one-third the space of the United States. And it was there that he learned to let go. The secret is to stop trying to control the chaos and focus on what you can control-your own actions, words, and thoughts. Move forward, make mistakes, trust your intuition, and find your purpose. In this inspiring book, Miglani shares the experiences and encounters that helped him finally get it. What happens when you find yourself in an Indian village with no money and a plane to catch? How could an educated urban woman agree to a marriage after two dates? What keeps a rural health worker motivated despite the enormous need and such limited ability to help? What does trying to catch an insanely overcrowded bus teach you about perfection? Embracing the chaos, Miglani found, "leads us down paths we never would have walked on...It brings out strengths we never knew existed inside of us."